On April 22nd, 1964, thirteen members of An Garda Síochána held a meeting in the historic Dublin Castle to discuss the possibility of forming a Garda credit union. Those present understood the benefits that such an organisation could bring to its members, and wasted no time in forming it. That very day, the first Board of Directors was elected. Sadly, some of these pioneers are no longer with us. 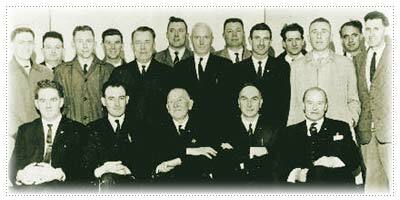 This picture shows the board of directors from 1966. We are proud to have 12 committee rooms and our main banking hall named in honour of our original Board of Directors in our branch today. 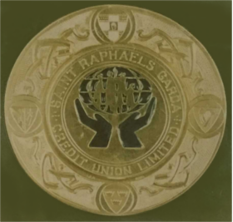 Soon after its formation, St. Raphael’s was unofficially christened the ‘half-crown’ club by the partners of members of the Garda force at the time. This was because new members were required to lodge a minimum of a half-crown (ask your parents if you don’t know what this is! ), and borrowing was only allowed for domestic items such as fridges and cookers. Our first registered office was unofficially known as the Barber’s Shop. It was a room at Dublin Castle, the use of which was kindly allowed by the Garda Authorities of the day. In 1971, we briefly occupied a room at 8 Harrington Street, before finally purchasing, for the first time, an office of our own in 1972. This was at 17, South Circular Road. 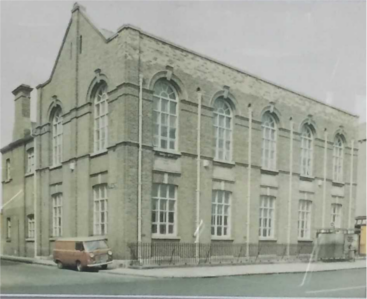 Five years later, in 1977 we acquired our home at Dorset Street which we had many a happy year. In June 2005 we relocated to our current building on the Naas Road which is a modern purpose built building to cater for the needs of the credit union and its members. By the end of 1964, 119 people had joined the credit union. A far cry from the current membership, which exceeds 35,000. Thanks to the foresight and dedication of our various boards of directors over the years, we have grown to become Ireland’s largest credit union.